Hero of Alexandria (/ˈhɪəroʊ/; Greek: Ἥρων ὁ Ἀλεξανδρεύς, Heron ho Alexandreus; also known as Heron of Alexandria /ˈhɛrən/; c. 10 AD – c. 70 AD) was a mathematician and engineer who was active in his native city of Alexandria, Roman Egypt. He is considered the greatest experimenter of antiquity and his work is representative of the Hellenistic scientific tradition. Hero published a well-recognized description of a steam-powered device called an aeolipile (sometimes called a "Hero engine"). Among his most famous inventions was a windwheel, constituting the earliest instance of wind harnessing on land. He is said to have been a follower of the atomists. Some of his ideas were derived from the works of Ctesibius. Much of Hero's original writings and designs have been lost, but some of his works were preserved - mostly in manuscripts from the Eastern Roman Empire, and a smaller part in Latin or Arabic translations. Hero may have been either a Greek or a Hellenized Egyptian. It is almost certain that Hero taught at the Musaeum which included the famous Library of Alexandria, because most of his writings appear as lecture notes for courses in mathematics, mechanics, physics, and pneumatics. Although the field was not formalized until the twentieth century, it is thought that the work of Hero, his automated devices in particular, represents some of the first formal research into cybernetics. Hero described the construction of the aeolipile (a version of which is known as Hero's engine) which was a rocket-like reaction engine and the first-recorded steam engine (although Vitruvius mentioned the aeolipile in De Architectura some 100 years earlier than Hero). It was created almost two millennia before the industrial revolution. Another engine used air from a closed chamber heated by an altar fire to displace water from a sealed vessel; the water was collected and its weight, pulling on a rope, opened temple doors. Some historians have conflated the two inventions to assert that the aeolipile was capable of useful work. The first vending machine was also one of his constructions; when a coin was introduced via a slot on the top of the machine, a set amount of holy water was dispensed. This was included in his list of inventions in his book Mechanics and Optics. When the coin was deposited, it fell upon a pan attached to a lever. The lever opened up a valve which let some water flow out. The pan continued to tilt with the weight of the coin until it fell off, at which point a counter-weight would snap the lever back up and turn off the valve. A windwheel operating an organ, marking the first instance in history of wind powering a machine. A syringe-like device was described by Hero to control the delivery of air or liquids. Around 100 AD, Hero had described an odometer-like device that could be driven automatically and could effectively count in digital form–an important notation in the history of computing. However, it was not until the 1600s that mechanical devices for digital computation appear to have actually been built. Hero described a method for iteratively computing the square root of a number.Today, however, his name is most closely associated with Hero's formula for finding the area of a triangle from its side lengths. He also devised a method for calculating cube roots in the 1st century CE. A 2014 The History Channel television show Ancient Impossible episode "Ancient Einstein"
Paul Levinson's Science Fiction novel "The Plot to Save Socrates" asserts that Hero was an American time traveler. The most comprehensive edition of Hero's works was published in five volumes in Leipzig by the publishing house Teubner in 1903. ^ John H. Lienhard (1995). "Hero of Alexandria". The Engines of Our Ingenuity. Episode 1038. NPR. KUHF-FM Houston. ^ T. D. De Marco (1974). "Gas-Turbine Standby-Power Generation for Water-Treatment Plants", Journal American Water Works Association 66 (2), p. 133-138. ^ Justin E. Wilson (2006). Heron’s Formula Archived 2009-03-26 at the Wayback Machine, University of North Carolina at Charlotte. ^ Hero of Alexandria (1851). "Temple Doors opened by Fire on an Altar". Pneumatics of Hero of Alexandria. Bennet Woodcroft (trans.). London: Taylor Walton and Maberly (online edition from University of Rochester, Rochester, NY). Archived from the original on 2008-05-09. Retrieved 2008-04-23. ^ "Russian animation in letters and figures | Films | «GERON»". animator.ru. 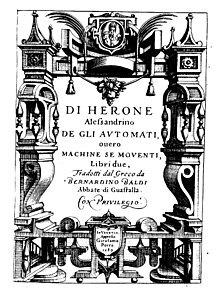 ^ De gli automati, overo machine se moventi, Volume 2 (Venice, 1589; repr. 1601), On Automaton; translated from the Greek. ^ O'Connor, J.J. & E.F. Robertson. "Heron biography". The MacTutor History of Mathematics archive. Retrieved 2006-06-18. Drachmann, Aage Gerhardt (1963). The Mechanical Technology of Greek and Roman Antiquity: A Study of the Literary Sources. Madison, WI: University of Wisconsin Press. Landels, J.G. (2000). Engineering in the ancient world (2nd ed.). Berkeley: University of California Press. ISBN 0-520-22782-4. Marsden, E.W. (1969). Greek and Roman Artillery: Technical Treatises. Oxford: Clarendon Press. Wikimedia Commons has media related to Hero of Alexandria. Wikisource has the text of the 1911 Encyclopædia Britannica article Hero of Alexandria. "Hero of Alexandria" . New International Encyclopedia. 1905.